Researchers from FOM institute AMOLF and the University of Pennsylvania have produced an artificial material with optical characteristics that do not occur in nature. These optical characteristics in this material are not determined by the atomic structure, but by a structure on the metascale: between the atomic lattice distance and the wavelength of light. The metamaterial consists of thin layers of silver and silicon nitride, which are piled up like a sandwich. As the thickness of each layer is smaller than the wavelength of visible light, the effective optical characteristics are a combination of the characteristics of the metal and the dielectric material. How light passes through a material depends on the material's permittivity: the resistance of the material to the electric fields of the light waves. By making use of the fact that the permittivity of silver is negative and that of silicon nitride is positive, the researchers could accurately influence the effective permittivity. By doing this they made a material with a permittivity that is effectively zero. As a result of this the light appears to encounter no resistance and can therefore propagate itself with an infinite phase velocity. The effective wavelength of the light then becomes infinite. The researchers produced this material by making use of a combination of vapour deposition and focused ion beam milling. Using a specially constructed interferometer the researchers demonstrated that light in the metamaterial does indeed propagate itself without a strong phase change and so it has an infinite wavelength. The researchers have explored how changing the thickness of the layers affects the optical characteristics. They also determined how light falling onto the material from different angles propagates itself. Metamaterials could be used in integrated optical circuits, lasers, LEDs and solar cells. The research was published in the journal Nature Photonics. 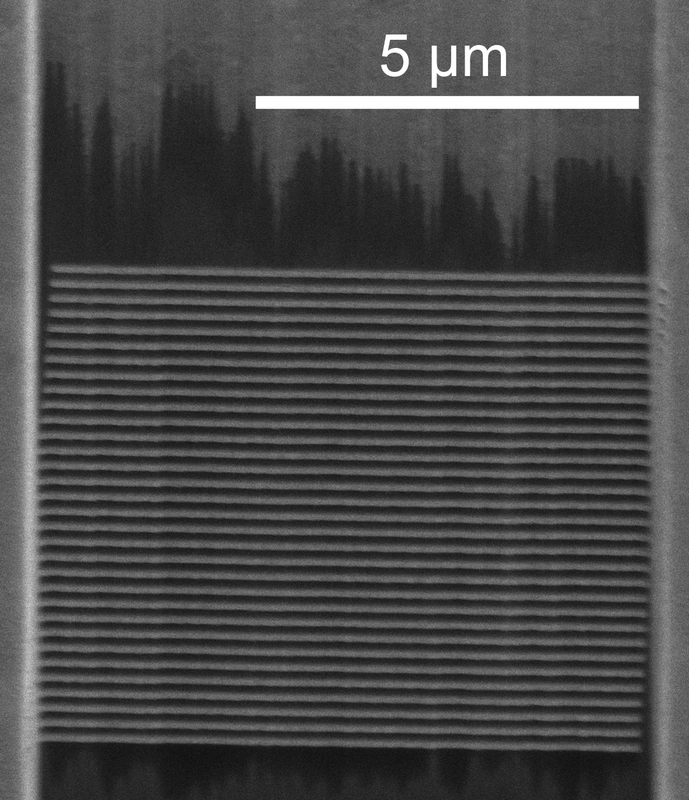 An electron microscope image of the upper surface of the manufactured metamaterial. The alternating silver and silicon nitride layers are clearly visible as dark and light bands. The upper surface of the metamaterial has been polished with an ion beam to remove excess silver.